and dropped from our 2019 Itinerary. An unforgettable journey through a grand tradition of astronomy. You can almost feel the weight of history around you, of the centuries of stargazers who have come before you and looked up at the same dark skies with the same feelings of awe, wonder, and intense curiosity. 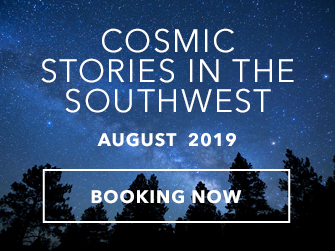 As you stroll through the picturesque gardens of the historic Birr Castle and wander through the ruins of stone-age Newgrange, you wonder if your ancestral sky watchers had the same questions as you. What forces shape the points of light in the night sky? How are we connected to them? Are we alone in this seemingly endless cosmos? Kerry Reserve. Killarney National Park. Lough Gur. So many treasured corners in this country to savor unfettered access to rich, dark skies. The food. The people. The culture. The sights and sounds of a gorgeous country. A potent mix that pulls you in, draws you skyward, and makes you feel at home. Please note: Itinerary, hotel selection, and stargazing sessions are subject to change due to weather and other factors beyond our control. Tour logistics provided by Collette Travel. The deposit amount as indicated above is due upon reservation. Final payment is due 60 days before departure. Purchase of a Travel Protection Plan is highly recommended and must be purchased at time of deposit. Payment of a per-person waiver fee guarantees a full refund of all payments (including deposit) except for the waiver fee itself, in case of cancellation of travel plans for any reason prior to the day of departure. Six months prior to departure the non-refundable deposit will be retained. For cancellation between 60-16 days prior to departure: cancellation fee of 30% of total price. For cancellation between 15-1 days prior to departure: cancellation fee of 50% of total price. For cancellation on the day of departure and after: 100% of total price.